Ideally located in the prime touristic area of Sapporo Station, Hotel Keihan Sapporo promises a relaxing and wonderful visit. Featuring a complete list of amenities, guests will find their stay at the property a comfortable one. All the necessary facilities, including Wi-Fi in public areas, laundry service, restaurant, bicycle rental, free Wi-Fi in all rooms, are at hand. Some of the well-appointed guestrooms feature desk, bathtub, television LCD/plasma screen, hair dryer, refrigerator. Enjoy the hotel's recreational facilities, including massage, before retiring to your room for a well-deserved rest. 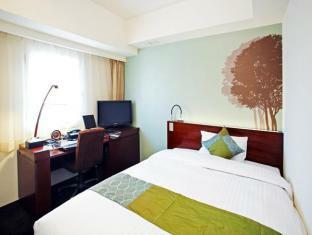 Hotel Keihan Sapporo is an excellent choice from which to explore Sapporo or to simply relax and rejuvenate.